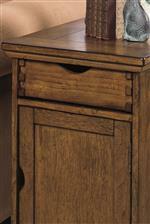 Enhance your living room with this storage-filled chairside cabinet. The piece features one door and one drawer, with a built-in magazine rack in the back. 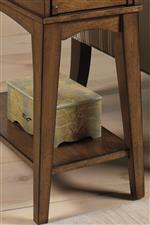 Splayed tapered legs and a light Distressed Pecan finish add a touch of mid-century modern style to this casual piece. The 7013 Chairside Cabinet with Magazine Rack by Null Furniture at SuperStore in the Williston, Burlington, VT area. Product availability may vary. Contact us for the most current availability on this product. Showcasing clean lines, plank style detailing, and a distressed Pecan finish, this collection of occasional tables is an intriguing mix of mid-century modern style and arts and crafts design. Pieces are small in scale and packed with storage - perfect for smaller homes and living rooms. Tapered and splayed legs create mid-century modern silhouettes, while details like plank wood tops and tray drawers highlight arts and crafts style. The 7013 collection is a great option if you are looking for Casual furniture in the Williston, Burlington, VT area. Browse other items in the 7013 collection from SuperStore in the Williston, Burlington, VT area.